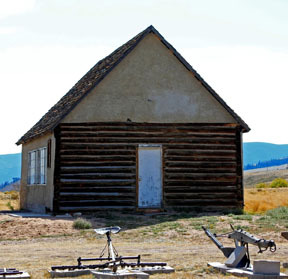 This one room school house was used from the early 1900s until the early 1960s. Originally a log building, it was covered with stucco after the students’ parents attended a Christmas program at the school in the late 1950s and realized just how cold the building was; it was heated only by a cast iron stove which couldn’t keep up with the wind blowing in between the logs. In its original location, the school had an outhouse, and a stable out back where the students kept their horses – their only mode of transportation to and from school. The school was moved to the museum grounds on August 17, 2007, thanks in part to grants from the Wyoming Cultural Trust Fund and the Guthrie Family Foundation. The interior has been refurbished and furnished as it was when used as a school. We’ve been able to interview students who attended this school, as well as one of the teachers who arrived in Centennial when she was just 18 years old.